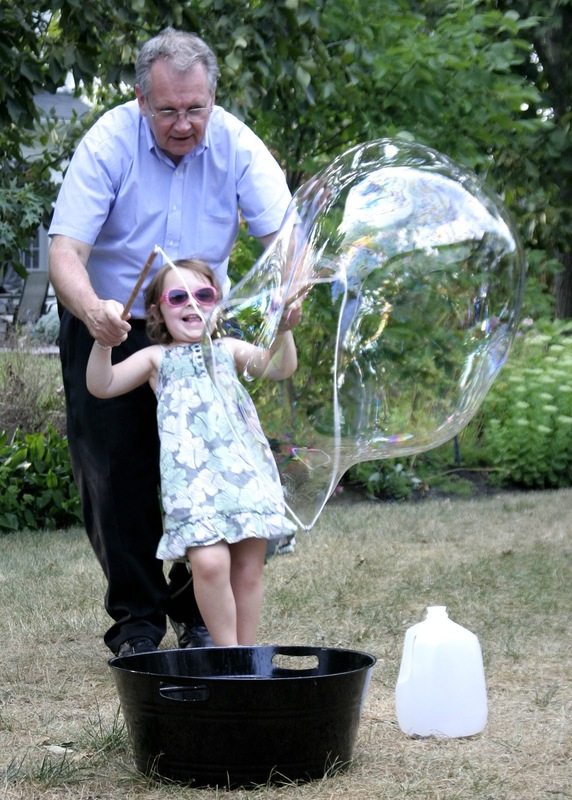 Kids, big and small, never outgrow a fascination with bubbles. 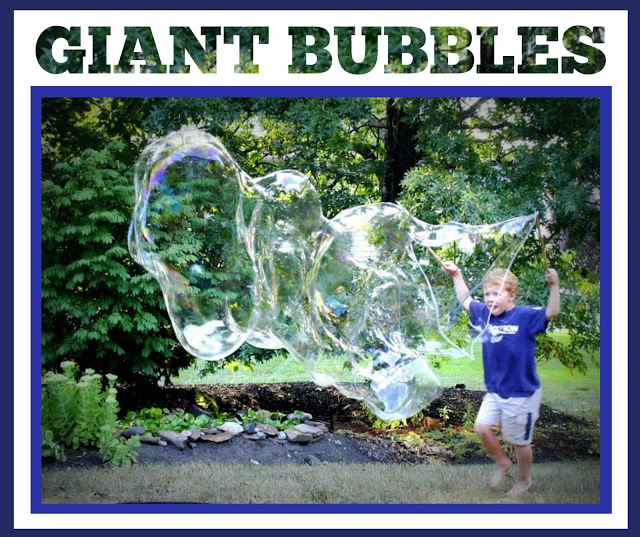 How many of those little plastic bottles of bubble solution have you bought through the years. Yes, me too. There is just something delightful in blowing little iridescent globes of various shapes that float effortlessly through the air and then suddenly POP! 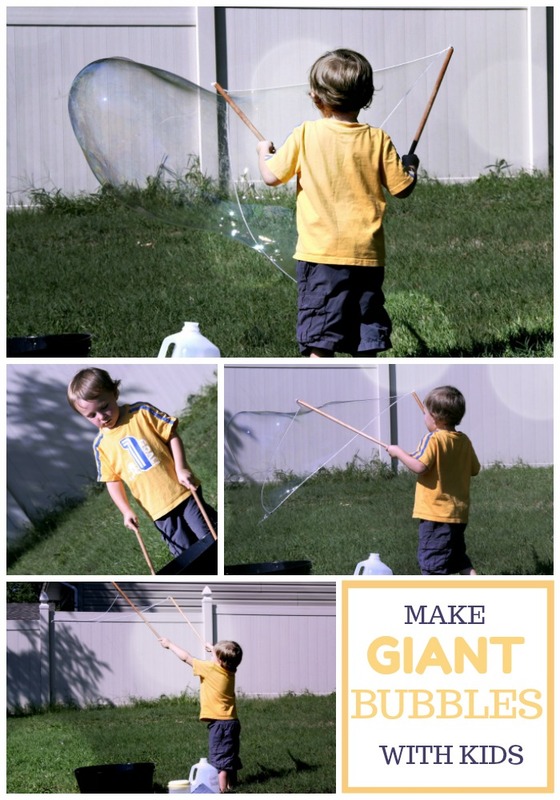 Imagine the FUN you and your kids will have making super GIANT bubbles. Time with grandchildren is some of the very best moments of all. They are even more precious when those grandchildren live a distance away. As our daughter Jill and husband, Brad’s visit was nearing an end, we had one last activity we wanted to do with the grandkids before they headed back to up-state New York. 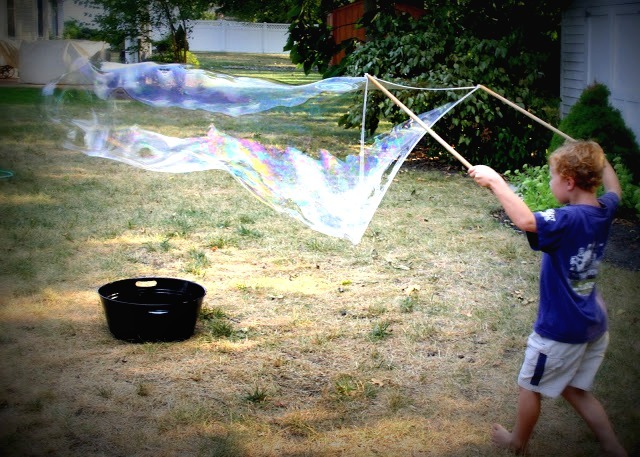 Making bubbles. GIANT bubbles. Bubbles they could almost climb into. And it was so much fun! If you are looking for a great activity to do with kids, grand kids, your own kids, neighborhood kids, youth group kids and even big kids, make a batch of bubble solution, use the double handled wand and see who can make the BIGGEST bubble! Ryan caught on quickly and was making some pretty impressive bubbles in no time. Shaela needed a little help at first from PopPop. 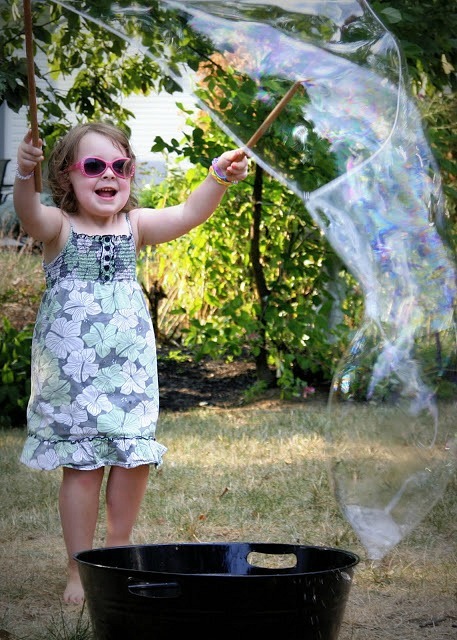 She soon caught on and was making some amazing bubbles all by herself. And, pretty thrilled about it. For convenience, supplies can be purchased from Amazon through links below. Pour the water into a bucket. I used a clean plastic container. 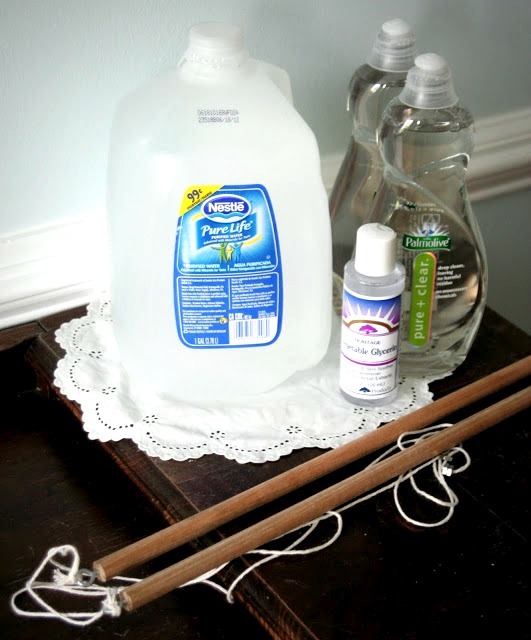 Pour the dish washing soap into the water. Then mix it gently with a wooden spoon. Pour the glycerin in; mix gently again. You don’t want ANY bubbles. 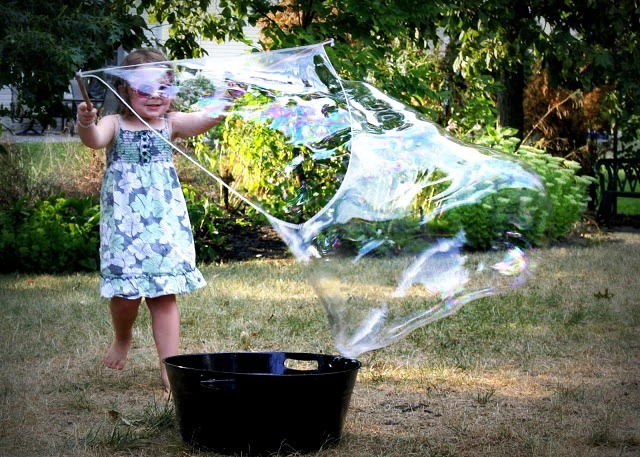 NOTE: Humidity has a lot to do with good bubble making so you might want to add a little more or less water to get a good consistency. Since it is so humid here in August, a little thinner was better. Drill a small hole in the end of each dowel as a started for the eye hooks. Screw the eye hooks into the holes you just drilled until they are secure. Cut a 70-inch piece of cotton string. Cut another piece of string that measures 30-inches. You can make the string as long or short as you like just as long as one string is longer than the other. Put the 3 to 4 nuts through the 70-inch (longer) string. 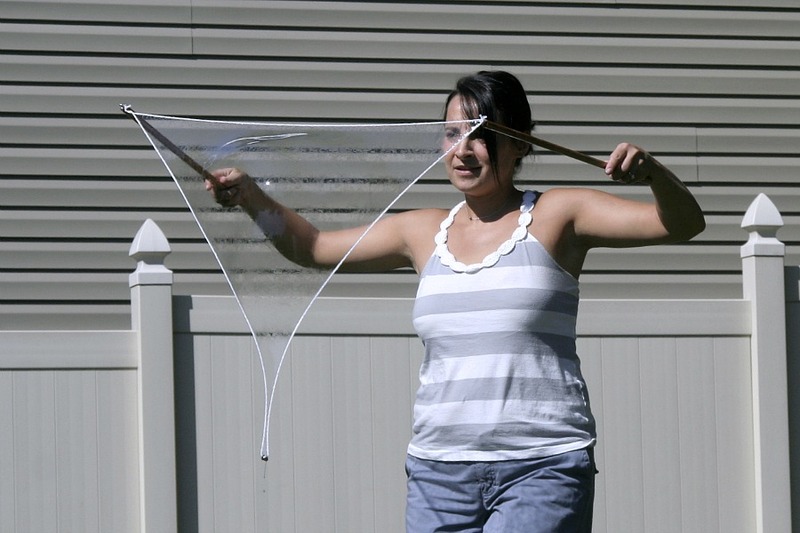 Put the ends of both pieces of string through one of the eye hooks and tie a knot. Do the same thing with the other eye hook. 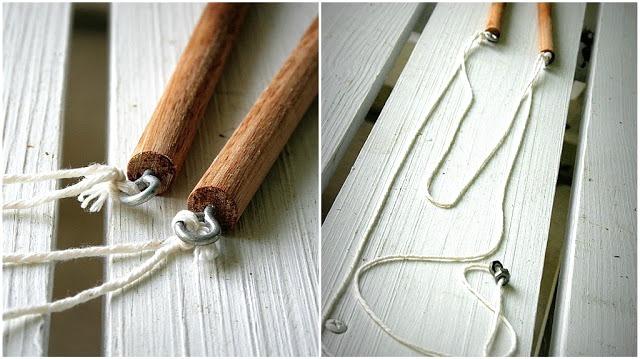 Now you should have a long string and a shorter one that runs from one dowel to the other. Even our pup lent a paw in the process of measuring the string and making the wand! Put the end of the dowels in the bucket so the string is submerged in the bubble solution. Bring the ends of the dowels up from the bubble solution, holding together until about chest high. Then separate the dowels by pulling them outward so the string makes a triangle that points down. The washers will weigh the center of the bottom string down. see photo below. 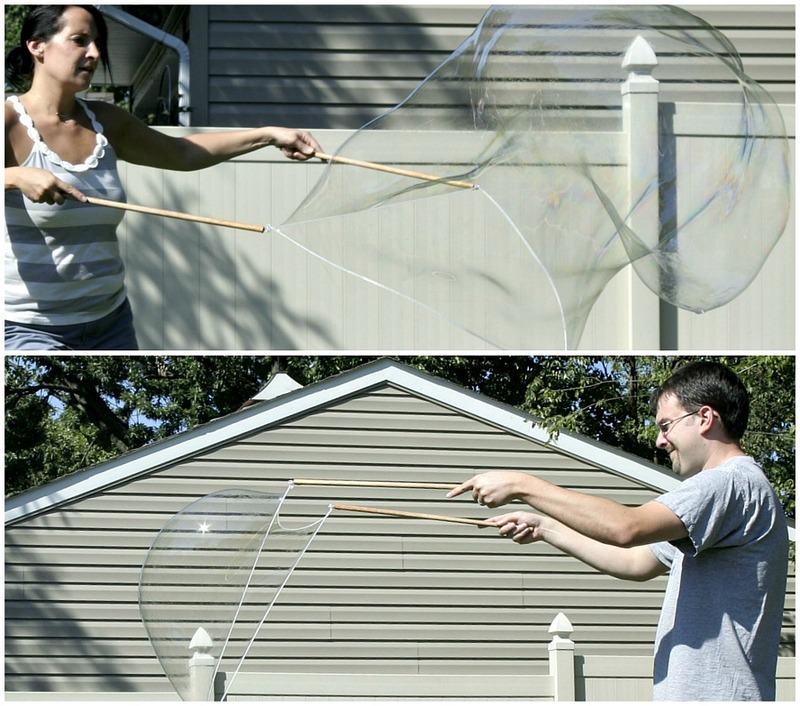 Step backward quickly so that the air goes through the bubble solution between the dowels and makes a bubble. 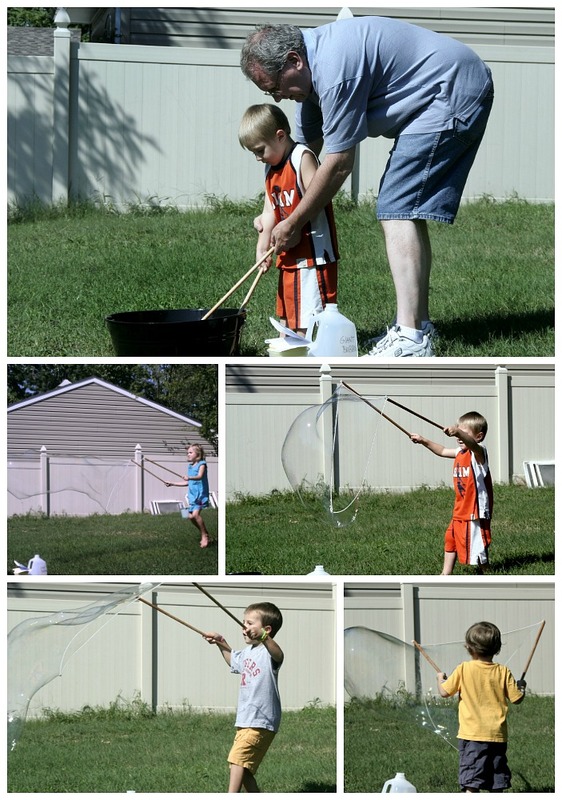 We had to give it a few tries before getting the hang of making the bubbles but as you can see, even littlest kids were quickly able to master it. This post is like a huge gift to me! Thank you so much! 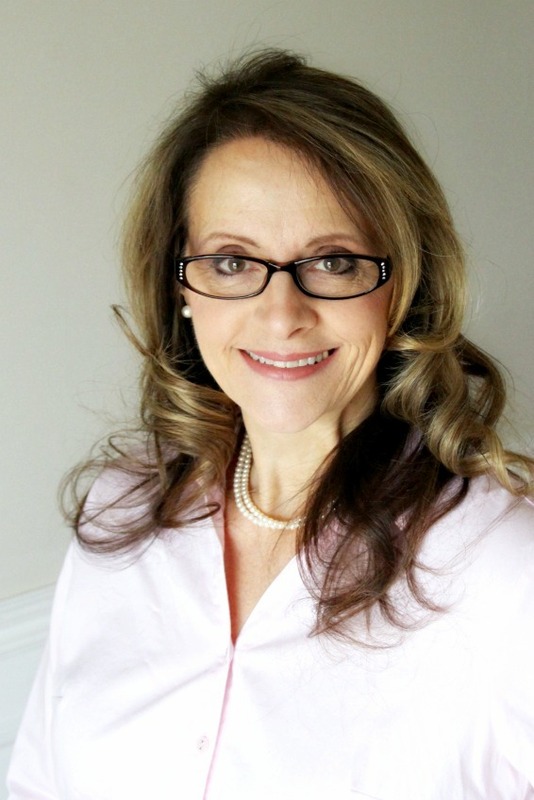 I am always looking for ways to fill the time, when our grandchildren are here! What fun pictures!